'Ankuram' is fun instilled learning tool in a game form designed to sow seeds of love and bonding towards one's home and homeland. Children learn facts about India and daily living skills in an innovative and interesting way. WIth 'ANKURAM' your child imbibes the Indian culture, values, traditions, festivals and much more. ANKURAM helps your child know India in a fun filled way. ANKURAM – Spreading the word of culture and values, is today on learning tables of Feather Touch International. We are glad to be associated with prestigious and award-winning playschool in Bangalore. Feather touch is one of the largest chains of daycare centres and preschools in Bangalore. Learning and development are at the core of Feather touch preschools and their fundamentals are built on value systems. ‘Ankuram’ is your answer to changing trends in learning. As someone said, we are now in times, where conversations happen through texting, arguments happen on phone calls and sharing of thoughts happen online. Times are going to be changing much faster, screen time on smartphones is replacing everything else.Relationships do not blossom in such a state. Parenting is going to be much more challenging in the evolving and changing times. We know parenting is not just about nourishing and educating children. it is also about raising responsible and dutiful citizens. ‘Ankuram’ instills the essence of our rich culture and ideals into your child’s thought process and positively influence behaviour. An individual would never act in a way that could harm his family or friends.This is because of bonding one develops towards home. This applies to a country too. A citizen who has love and bonding towards his/her country, would not commit to, or involve in actions contradictory to country’s Security, Sovereignty & Integrity. Sowing seeds of bonding in blooming hearts has always been primal responsibility of parents and schools, as they are best placed to inculcate this from a young age. ‘Ankuram’ tool is designed to sow seeds of love, respect and responsibility in children’s heart in a very subtle and interesting way. How ‘Ankuram’ helps your child Learn? ‘Ankuram’ is fun instilled Learning Tool in a Game form. Children learn quickly and easily when all their senses i.e., Visual (sight), Auditory (sound) and Kinesthetic (touch) are involved in the learning process. This game gives child a visual appeal to “Indian Map” in form of a playboard and colourful cards. Challenges prompt child to ‘speak’ and ‘hear’ the facts. They get ‘sense of reality’ as they touch the game elements and move through the land form on game board. The experience helps them to gather, register and reproduce the facts about country in their daily lives with ease. The game, when administered by an adult, would enhance gaming experience to kids. Narration by an elder about each element present on game board could open up numerous thoughts and ideas to kids and instill positive connotations about learning and recalling. Children face fun challenges in form of colourful images and attractive text. In the process of answering and observing others, they learn facts, etiquettes and also learn to comprehend hidden messages associated with homeland. The game involves activities that are meant to give fun time and also aid children to introspect. This helps parents to understand their children hidden feelings and emotions. Why ‘Ankuram’ is special for your child? India has many symbols and we take pride in them. Symbols are mental pictures and statements of who we are and what our objectives are. Symbols form our identification and unite us as one. Some Symbols are simple and straight forward while few others possess intrinsic meaning. ‘Ankuram’ helps your child to learn and appreciate such symbols. They instill a sense of pride and patriotism in child’s heart. 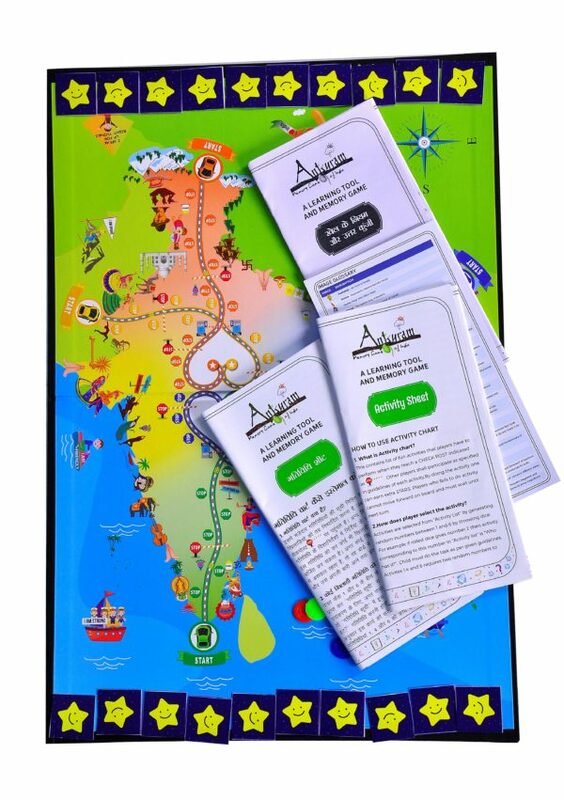 INDIAN Map is depicted in visual format on ‘Ankuram’ game board with roadways, checkposts, tollgates and direction boards. This gives the child close-to-reality experience of Indian terrain travel. Children tend to think spatially, which is one of the most important skills that help them think in a way that relates to space, position, area and size. ‘Ankuram’ helps your child to become good at wayfinding, to think visually by which, in due course, they become good at analysis and interpretation of complex figures and data. Etiquette is gracious and polite behaviour in family, social and professional situations. It is a vital trait and it could be a deciding factor between success of failure in a particular situation. Proper etiquette helps children to grow into poised adults. ‘Ankuram’ presents picturesque and inspiring challenge cards depicting some fundamental social and family etiquette that every child must learn. ‘Ankuram’ is a visual treat for your child with more than two hundred images that help you tell your child some of the finest stories about Indian culture, traditions, values, festivals, symbols, cities, daily life skills and much more. It can be used as a perfect bed time story initiator. ‘Ankuram’ game space is designed with affirmation statements that instill confidence, belief, positivity, ambitions and much more. ‘Ankuram’ comes with a pack of fun activities which require interaction between players. This helps your child to build social skills like verbal communication, sharing, taking turns and waiting. It helps to lengthen your child’s span of attention by way of completing the exiting game. Your child learns ‘Resilience’ which means to quickly recover from disappointments. Your child also learns to become more organized and transforms into more socially acceptable personality. Activities that kindle your child’s thinking, visualizing, creative and imaginative skills are made part of this exciting game. You can listen to your child communicating their likes, dislikes, favourites and fears in a fun way and step into their world for a while to get to know them even better. The price shown is exclusive of taxes & delivery charges. GST @ 18% extra. Ankuram ships products to all cities across India, as well as selected countries outside India. Customers are requested to provide full and accurate address with proper pin/zip code. Ankuram will NOT be liable for delays or other issues resulting from incomplete OR incorrect address listings. Billing address is the address where customers receive their Credit Card statements. Shipping address shall mean the address where the order needs to be delivered to. Ankuram ships worldwide to certain locations. The shipping charges are based on the weight of the package and the destination address. The product will be billed together with the shipping charges. Ankuram is the talk of the town. A board game curated on India has so much to offer for the younger minds, gives them the base to know facts of their motherland. Yes! but the best part what I can relate to as a life skills trainer is it works with the emotional aspect of Childern so well. I am definitely going to use it not only for my daughter but also as a learning tool to help a lots of my other life skills students. Ankuram is a very good game for young minds.It gives information about different cultures and places of our country.The cue cards help children gain more general knowledge and also mannerisms. It is also a interactive game where children get to open up about their feelings. – Box cover can be made more attractive for kids. – Activities are the highlights of this Game. With these activities, kids will really improve their communication skills, presentation skills, reading skills and listening skill. Also, Parents can know about their kids and what they are going through, with these activities. Ankuram is the perfect learning game tool to teach kids about Indian Culture, etiquette and much more. Definitely, a box filled with activities that make learning fun and very interesting for kids!